Classic telescopes are of interest to amateur astronomers for a variety of reasons. There are the dedicated collectors, but there are also many amateurs who love the nostalgia they inspire. These telescopes "feel" different from any contemporary telescope and perhaps have a unique ability to reconnect the owner to a bygone age of craftmanship. This book takes a look at traditional telescopes built by the great instrument makers of the 18th and 19th centuries, particularly the dynastic telescope makers, including Dollond, Alvan Clark, Thomas Cooke & Sons, and Carl Zeiss. Also included are lesser luminaries such as John Brashear, John Calver, William Wray, Henry Fitz, and William Henry Mogey. 'Classic Telescopes' covers the key features of the telescopes designed by these manufacturers, and shows how a heady combination of market trends, instrument condition, and pedigree will dictate their prices at auction. 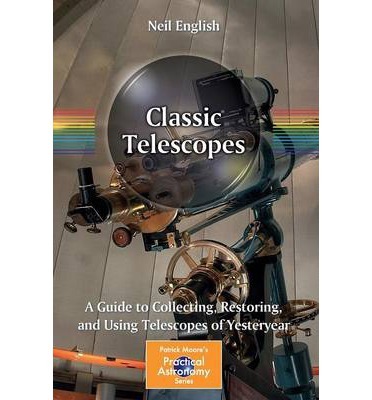 'Classic Telescopes' also shows the reader how to find real bargains! Interviews with top classic telescope collectors (and users) provide the best tips of prospecting for a genuine acquisition.